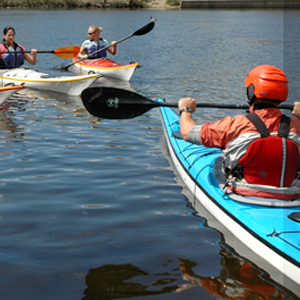 Charles River Canoe & Kayak is happy to work with you to create the perfect outing for your group. The possibilities are endless — canoes or kayaks; at our rental centers or a location of your choosing; guided trips or on your own; top-notch catering and expert instruction; we can do it all. For more information on creating the perfect custom event for your group, browse the ideas described below. We’re sure you’ll find the ideal outing! To start planning your outing, Request a Quote Online or contact us by phone at (617) 965-5110 [M-F, 10am–5pm] or by e-mail for more information. In our most basic outing type, your group rents boats with no guiding or instruction at one of our rental locations. Just show up and get on the water! 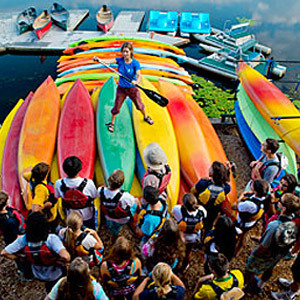 Our trained dock staff will give you a basic dryland paddling orientation at no additional charge. You can choose from any of our available rental boat types, though the favorites are kayaks (single and double) or canoes (standard and Tripper XL). Most groups spend one to two hours on the water. If you plan to stop along the way (for a snack at the Esplanade, for example), add extra time. 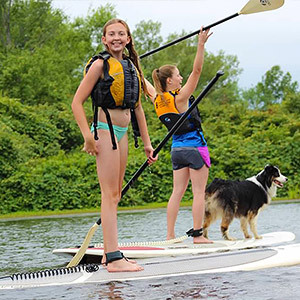 Kids’ groups will need a sufficient number of adults to accompany their group on the water. See our maximum child-to-adult ratios for details. For a new and different experience, try our One-Way Rentals between Kendall Square and Allston/Brighton or a Shuttled River Trip from Nahanton Park in Newton — an unforgettable event for sure! Some groups may not want to venture out on their own. Others may want to learn about the history and wildlife of the area, or build their paddling skills. If so, a guide and instructor is just what you need! All our guides are also instructors, and they can help your group members with boat control and paddling efficiency. They’re sure to enhance your experience on the water. Learn about our group rates for guiding! Groups can picnic right at our location! You can choose to augment any paddling trip with food, either before, during, or after your time on the water. Each of our locations has a picnic area with a water view (see detailed information about each location’s facilities: Cambridge, Boston, Newton/Nahanton Park, or Waltham). You may bring your own food or have your event catered, and we are happy to arrange catering for a fee. Learn more about catering with us, or consider one of our pre-planned tours that includes food (listed below)! Groups love the combination of paddling and food, so talk to us about the many tasty options! We’ve been combining tours of the Charles River with great food for years, and three of those tours hav e become favorites for group outings! Consider one of these tours for your group and see why everyone loves them. Our Barbeque Tour is our all-time favorite group event. Spend about 90 minutes on the water and come back to a glorious barbeque picnic catered by Redbones of Somerville. The Barbeque Tour can be held at any of our locations. From our Cambridge location in Kendall Square, we offer our spectacular Skyline Tour. Enjoy about 90 minutes on the water basking in the best skyline view in Boston and exploring the lagoons of the Esplanade. You can opt for light snacks on the water or a full meal to finish the tour! Also from our Cambridge location, we offer a unique Harbor Tour that combines amazing skyline views with the excitement of venturing onto Boston Harbor! During this three-hour tour, see the Esplanade, Museum of Science, Zakim Bridge, and U.S.S. Constitution. As with the Skyline Tour, choose between light snacks on the water or a full meal to finish the tour. For the ultimate Boston Harbor experience, our four-hour Barking Crab Tour will take you from Kendall Square through the locks and along the waterfront, culminating in lunch at the Barking Crab, Boston’s most famous waterfront clam shack. 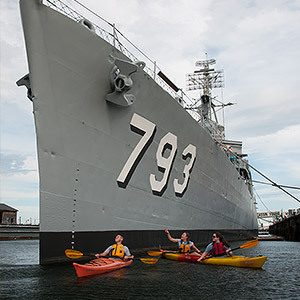 Take in amazing skyline views and feel the exhilaration of paddling on Boston Harbor. Any of our events will bring your group closer together. However, if you want a specialized program to turn your group into a team, consider our Facilitated Team-Building Outings. Our trained facilitators will work with your group — new recruits, a branch office, long-time co-workers, etc. — and improve cohesion, cooperation, communication, synergy, leadership, and more. At the same time, your group will enjoy a welcome respite from the office. Unwind after your paddle with a relaxing and soothing Chair Massage from Mass Mobile Massage. The cost for each mobile masseuse is $140/hour. Each masseuse can serve 2–10 customers in an hour, depending on the length of each massage. 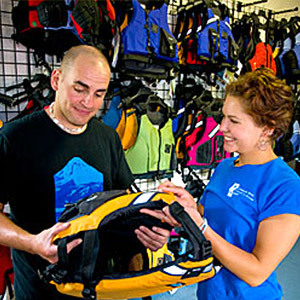 If your group wants to explore areas other than our rental centers, we can create customized outings to any location! There are many great destinations in eastern Massachusetts; see some of our favorites below. We will deliver canoes and kayaks according to our boat delivery rates, and can provide guiding/instruction at our group instruction rates. 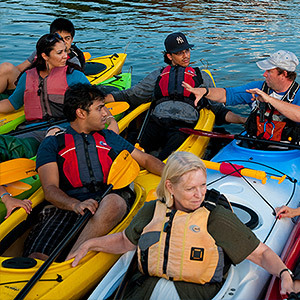 Groups looking to paddle on the ocean should consult our custom sea kayaking trip rates. Shuttled Trip from Nahanton Park: The most cost-effective “get-away” trip is a shuttled trip from our location in Newton’s Nahanton Park. We’ll transport your group by van to the put-in 10 miles upstream, and you can enjoy this scenic, less-developed, wildlife-rich stretch of river at your own pace. Upper Charles River: There are several wonderful trips on the Upper Charles River. Between Rt. 109 in Millis/Medfield and Rt. 27 Our Ten-Person Rabaska Canoes are great fun for groups! in Medfield/Sherborn (5 miles), the river winds extensively and has a wide, marshy flood plain. Before Rt. 27 you will pass the hidden entrance to South End Pond. Continuing beyond Rt. 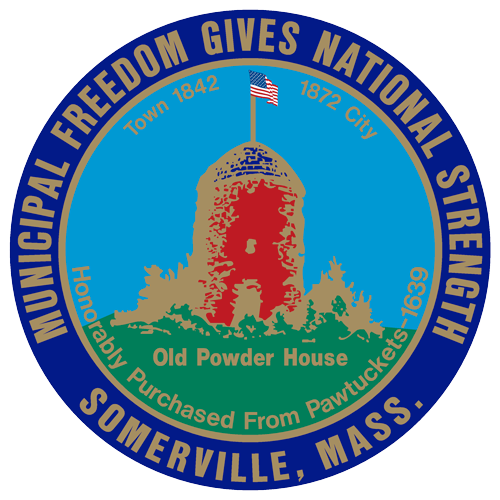 27, you’ll reach Pleasant St./South Natick Dam (5 miles). In this stretch, the river is much straighter and passes through conservation land, including Rocky Narrows Reservation and Broadmoor Wildlife Sanctuary. You’ll see some exciting rocky outcrops, like Rocky Narrows and King Philip’s Overlook. We also like the 5-mile stretch between Elm Bank Reservation (South Natick) and Red Wing Bay (Needham). This stretch of river has more houses along the shore, but winds past some interesting marshy areas with lots of wildlife. Sudbury/Concord River: The Sudbury and Concord Rivers pass through the Great Meadows National Wildlife Refuge and encompass the longest stretch of flatwater in Massachusetts. In general, the river in this area has a wide floodplain surrounded by marshy areas and lots of wildlife. Possible put-ins/take-outs include Sherman’s Bridge Road (Wayland/Sudbury), Rt. 117 (Lincoln), Lowell Road (Concord), and Rt. 225 (Bedford). The Sunset Tiki BarSunset Tiki Bar at Nashoba Valley: If your group is looking for a festive atmosphere on a small pond, consider the Sunset Tiki Bar in Westford. You can get off the water and hit the beach volleyball courts or slide right up to the full-service bar, complete with island-style music and a large beach. We are happy to deliver canoes for your group’s Tiki Bar outing. There’s nothing like the experience of paddling on the ocean! Ocean trips are great for smaller groups (10 or fewer participants) who are looking for a unique and exciting outing. 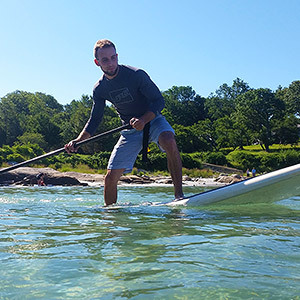 There are many possible locations, and our favorites for beginners are Cohasset Harbor, Marblehead Harbor, and Hingham Harbor because they are protected from weather but beautiful to paddle. For pricing information, see our custom sea kayaking trip rates! Charles River Canoe & Kayak can deliver boats to any location. We offer two delivery rates: a small-load rate and a large-load rate. The rates listed below are per load, and are based on one-way mileage from Charles River Canoe & Kayak in Newton/Auburndale. If you are renting the boats from us, the rate includes both delivery and pick-up; boat rental is additional, and we are happy to provide a trained staffperson to assist with people entering and exiting the boats, as well as provide a dry-land orientation, for $25 per hour. If no rental is involved, then the rate includes either a delivery or a pickup. For deliveries of one or two single kayaks, double kayaks, stand-up paddleboards, or canoes 18' or less in length, we offer a small-load delivery rate. With our vans and specially designed boat-carrying trailers we can carry up to 14 standard canoes, 20 double kayaks, 24 single kayaks, or 24 SUPs per load.